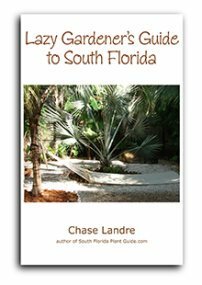 Enchanting caladiums sleep through winter's cold and emerge to provide summer color for shady places when warm weather arrives. 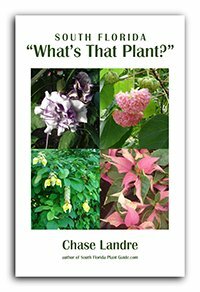 Their beautifully patterned, tropical leaves come in amazing combinations of red, pink, white and green, outstanding in a partial to full shade garden. Easy care as long as they receive adequate water, these shade plants can be used to advantage in many ways...naturalized under a tree canopy, as low growing plants for the front of the border, draping from hanging baskets, or accenting a mixed bed. They're very effective attention-grabbers when planted in "drifts" or groupings, but are also very charming peeking out here and there amidst ferns. 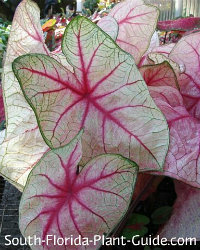 And white caladium varieties can be seen at night. A few varieties can take part sun or even full sun. But for the most part these plants like bright full shade or partial shade. An ideal part shade location provides a bit of morning or late day sun and not much more than dappled sunlight during the afternoon. Dappled light plays up the foliage color especially well. These plants are usually sold as tubers (similar in looks to bulbs). Place the tuber upright (the knobby side is up, the smooth side is down) in the hole and cover with about an inch or two of soil. If you can't tell which end is up, don't worry - it will grow...it will just take longer to find the soil's surface and begin to sprout leaves. Peak performance lasts several years...then the leaves tend to be smaller. You can freshen a caladium bed by interplanting with new ones, but digging up the old tubers and starting over gets the best results. Most caladiums tubers used worldwide are produced in Florida - in fact, a commercial grower's fields of these plants is one spectacular sight to behold. 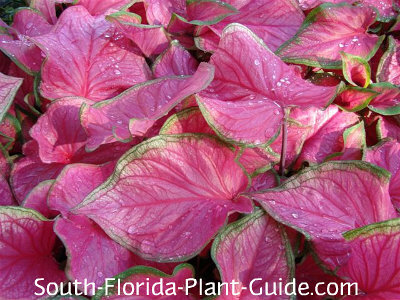 Lake Placid-Sebring area is known as the Caladium Capital of the World. And many newer cultivars have names like "Florida Sweetheart" (pictured above), "Florida Sunrise," and "Florida Calypso" (pictured below). The leaves of these plants can be used in indoor flower arrangements. Most range in height from 1 to 2 feet. They do best in partial to full shade, though certain varieties will take more sun. The best leaf color is achieved by planting each variety in the amount light it prefers. The leaves will die back in late fall as cool weather begins, and re-emerge the following late spring. 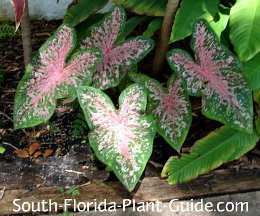 Caladiums are fast growers that do fine anywhere in South Florida. In more northern areas, tubers should be dug up and stored over the winter but here we have the luxury of just leaving them in the ground to "hibernate" till spring. Plant in late winter or early spring as soon as tubers become available at nurseries. Water on a regular basis - these plants like a well-drained area but need regular moisture. No trimming is needed, though you can remove dying leaves and stems if you like. Usually new growth covers old foliage pretty quickly. When you start to notice leaves becoming smaller and smaller, remove old tubers in spring and replace with new ones. Fertilize in spring with controlled-release fertilizer. Most benefit from liquid fertilizer applications throughout summer. 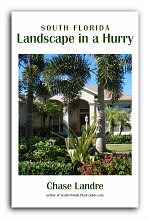 Don't over-fertilize white-leaved plants...too much food and they tend to revert to green. Place tubers about 8 to 12 inches apart. Come in from a walkway 6 or 8 inches to keep future leaves from being trampled. These plants work well in containers. The only downside is when they die back in late fall. COMPANION PLANT SUGGESTIONS: Iris, peace lily, agapanthus, dipladenia, cordyline and dracaena, dwarf powderpuff, ferns, and elephant ears.